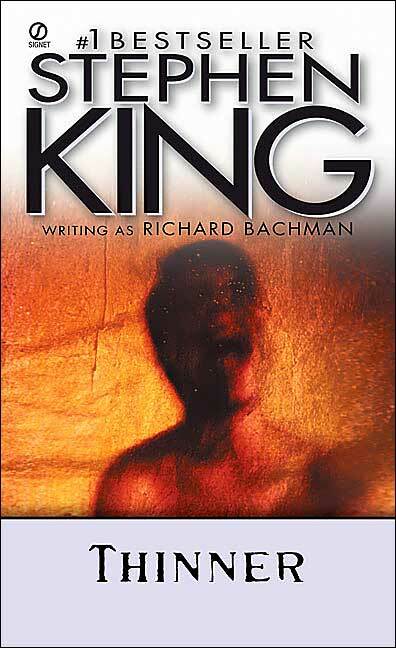 If we forget about the abysmal 2007 release of Stephen King’s trunk Bachman novel Blaze, then we can say that that Thinner is the second to last of King’s novels published under the Richard Bachman pseudonym Richard Bachman. If readers know what is good for them, they will forget all about Blaze anyway. Besides, Blaze was a trunk novel which would have been published long before Thinner saw the light of day in 1984. So, Thinner really is the second to last Bachman Book. The Bachman novels were leaner, sometimes meaner straight horror novels with only the occasional tinge of a supernatural element. This is different from the earlier novels published as Stephen King. The King novels tend to have a stronger sense of the supernatural. The opening of Thinner, and just a little bit at the end, is the only thing supernatural about the novel and even that supernatural bit is only window dressing. The novel opens with Billy Halleck, a 250 pound defense lawyer, remembering being touched and being cursed by an old gypsy at a carnival. “Thinner”, the gypsy whispered to the obese protagonist. The first several chapters count down Billy’s weight, from 248 and inexorably down beyond the point of healthy weight loss and into the fear. This is where Thinner lives and breathes, in the fear. Thinner may open with a gypsy curse, and the reader may see the affects of the curse with each passing chapter as Halleck loses pound after pound, but where Thinner (and Stephen King) is most successful is in describing the fear Billy Halleck has over the weight loss and the effect it has on his family. Thinner is a story of personal horror. The horror of Billy Halleck’s personal hell spirals out of his control as even eating 8000 calories a day only slows down the weight loss, but never halts it, and only for a time. At first Billy seeks medical answers from his cocaine snorting doctor Mike Houston, but later turns to a gangster to help with revenge, just as the gypsy curse itself was a form of revenge. Over the course of his career Stephen King can certainly be accused of writing to excess, of publishing overly bloated novels which could only benefit from trimming 100 or so pages out and tightening up the narrative. Even Christine, as good as it is, could have been trimmed to strengthen the novel (says the reviewer who is not a professional writer or editor). Thinner is not one of those books. Thinner is, pun intended, a lean, mean novel. The tightness of the storytelling ratchets up the tension and each time Billy Halleck steps on the scale the fear increases. There is nothing he can do and each pound puts him closer to a horrible death and closer to the end of the novel where something has to happen to change the status quo, even if we don’t know how the novel will end. As is the case in other King novels, Thinner’s ending is a bit of a pyrrhic victory. The price was far too high (for the characters, just about perfect for the readers), but that is part of the journey and it may have been the only way to end the novel. Brutal, brutal ending, but a very good one. Thinner is one of the stronger Bachman Books (along with The Long Walk) and is a solid effort in the first year of King’s second decade of publishing. Tiny Deaths: "Ashes to Ash"
At Ease With the Dead: "The Brook"
Portable Childhoods: "Guy's Day Out"
Portable Childhoods: "A Taste of Summer"
Hart & Boot: "Hart and Boot"
Portable Childhoods: "The Green Glass Sea"